In response to a number of requests our latest Club Design Tri Gear Order is now open online HERE. The women’s version of the Tri Suit and the Tri Top are lined. This will be the last order of club design gear this year so we encourage you to think ahead regarding your training & racing needs. A Junior uniform order will be sent out as soon as designs are finalized. 1. Size Chart: It is very important to measure yourself and check sizes against this chart. Fit is snug. A: Our suppliers are Cannibal - long time triathlon suppliers. A: No guarantee. If the minimum order numbers of an item are obtained, that's all we get. Q: Closing date is next Tuesday 22 October 2013, why? A: We have been advertising for some time that a uniform order was about to happen. To assist the uniform order volunteer, please get your orders in asap, today would be fantastic! Q: What is the turnaround time for delivery? A: Allow about 3-4 weeks from placement of order. You will receive an email when ready for collection. Congratulations to our Ironman World Championship finishers Marcus Lisle, Bryan Hopkins and Stef Puszka who yesterday experienced the magic that is Kona. It’s one hell of a tough day out, with the lure of that Ali’i Drive finish line the driving force. They would have heard many times yesterday, but here it is again – Good Job! Meanwhile, back here at home we have a sprint tri to look forward to this weekend. Apologies for the distance error in last E News, we have had a few changes to the calendar and that one slipped through. 1. If you already have your timing chip remember to bring with you. 2. If you still need to collect your chip, please come early to registration. 3. 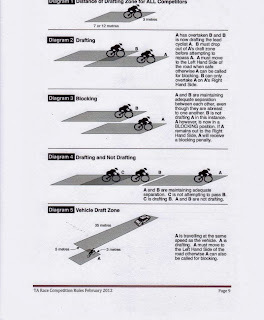 We wish to encourage you all to know at least the basic rules of triathlon including those regarding Drafting. 4. 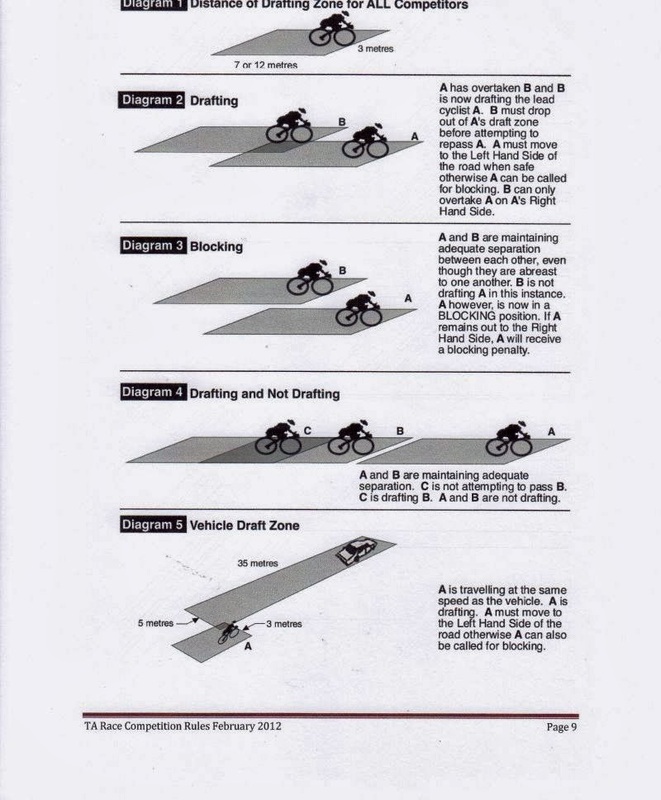 Drafting during the bike leg is against the rules and is considered unfair. The diagram below demonstrates draft zones. A good way to familiarise yourself with the distance is to measure it out in a hallway at home. There are also markers (albeit very faint) in the middle of our usual transition area. 5. The basic rules of triathlon are attached. Have a quick read, if you don’t understand anything ask one of our friendly technical officials before the race. 3. FOR SALE: A pair of women's carbon Shimano road bike shoes size 41. The latest type WT60 light weight and going for a good price. They have only been used once and still in excellent condition. The colours on the shoes are white, black and pink. The road bike shoes are selling for $160. Contact Jemima 0404 777 680. 2. Many of you also know former member Bob Martin. He went 14th M65-69 in 13.25.10 to realise his dream of a Hawaii finish. 5. To have won M65-59 at Kona this year, you would have needed 10.44.31 in the men and 12.57.17 in the women. 6. It was refreshing to see the delight experienced by both 2nd placegetters at Kona. Luke McKenzie and Rachel Joyce are over the moon with their results. 7. That cranky chef bloke Gordon Ramsey finished in 14.04.48. 8. Two additions to the Ironman calendar have been announced which are doable from Darwin. IM Malaysia makes a return in September 2014 and IM 70.3 Putrajaya in April. 9. Rowan Beggs-French’s 24hr MTB race in Canberra unfortunately came to an abrupt end. Rowan is now sporting a line of stitches in his knee after crashing out. We wish him a speedy recovery. 10. Our uniform order is good to go, just waiting on confirmation from the online rego folk. Look for a separate email.